Cate Blanchett plays Jasmine, a socialite with all the wrong moves, in Blue Jasmine. I’ll admit I did not see Blue Jasmine when it first came out in theatres. The Oscar buzz for it prompted me to watch the DVD. I’m glad it did and now I know why it’s buzzing. Jasmine comes off a plane from New York to San Francisco. She tells the elderly female passenger next to her the story of how she used to be a top socialite in New York but is near broke and hoping to start a new life. She appears to have impressed the passenger but we learn in a conversation to her husband she didn’t welcome herself to Jasmine. Jasmine then goes to her sister Ginger’s apartment. The bizarre thing is Jasmine hardly ever gives Ginger any contact but is now seeing her because of her dire straits. It’s funny since Ginger–whom is actually sister to Jasmine via her parents’ adoption–always credited Jasmine as having the good genes. The problem is that even though Jasmine is drowning in debt, she’s still set in her opulent ways. Frequently Jasmine flashes back to her luxurious past with her husband Hal and her stepson Danny. Life was good for Jasmine and Hal appeared to be very successful as an investor It’s years ago when Ginger and her original husband Augie come to visit her in New York that things started to decline. First Jasmine offers an investment opportunity for Augie through Hal with the $200,000 he won in the lottery: money Augie was planning to use to start a business opportunity for himself. Augie and Ginger thought they’re being treated by Jasmine with a stay at the Marriott and their car and driver but Jasmine put them there because they cramped her style. It’s right during one of their sightseeing tours they noticed Hal kissing another woman. It later became clear that Hal is a fraudster who would eventually get arrested, convicted of fraud, sentenced to prison and later committing suicide. Augie’s money was lost and it led to Augie and Ginger’s divorce. Ginger forgives Jasmine even though Augie is still resentful but is now dating a mechanic named Chili, a man Jasmine resents at first sight and gives Ginger snide remarks about him. The remarks cause Ginger to leave Chili much to his hurt. Jasmine comes to San Francisco in hopes of starting a new life. She missed completing her anthropology degree because she fell for Hal. She wants to become an interior designer but has to take courses online and lacks computer skills. She reluctantly takes a job as a receptionist at a dentist’s office. Nevertheless it does not work out as Jasmine finds the job too stressful for her and receives unwelcomed sexual advances from the dentist. Things do improve for Jasmine as she falls in love with a wealthy widower named Dwight who’s a diplomat with plans to become a congressman. Ginger also meets a new love named Al at the same party. Jasmine is able to win Dwight’s affection through lies of her being married to a doctor who died of a heart attack. The lies fall through when Augie bumps into them on the street and tells the whole story, including the details that her stepson Danny is working in a record store in Oakland. Right in the car ride home Dwight calls off the engagement and leaves Jasmine on the street. She visits Danny at the record store to no avail. Danny didn’t even want Jasmine to know his whereabouts. He wants to leave the past behind which means never seeing Jasmine again. It’s right in a flashback at the end we learn of when Jasmine confronted Hal of his many affairs. Hal confesses he wants to divorce her in favor of a teenage maid for Danny. That was when she called the police and had Hal arrested for fraud which led to his imprisonment and suicide. In the end, Jasmine has to face the music for what she did to Danny, to Augie, for her interference with the love between Ginger and Chili, and herself in general. It seems odd at first to see a Woody Allen movie classified as a drama. We’re all used to Woody Allen doing comedies. Mind you it’s after seeing this movie that there are a lot of elements that are darker than what one would expect in a Woody Allen film. It succeeds in not being too comical and even serious in some of the harsher parts of the movie. Nevertheless there are a lot of comical elements in this film despite the situation. If there’s one thing that it does have in common with Woody Allen movies, it’s that it ends completely unexpectedly. It’s bizarre that you think things are going to go better for Jasmine in the end. Instead it all ends up worse, she fails at making peace with whatever wrongs of the past she did, whatever improvements in her own life fell through the cracks and she’s left all alone. She’s even confronted of her real name: Jeanette. She is the type of rich phony whom could easily charm and impress anyone but had a lot to hide and hid it well at the time. In the end, she has nothing left to hide and no one left to charm. She goes from being the life of the party to a person not even one on a park bench would want to be around. It’s also surprising since Jasmine would remind some of Scarlet O’Hara in Gone with The Wind. Sure, Scarlett lost it all in the end too but she still held her head high at the very end with a sense of hope. Here, you don’t see a hint of ‘Tomorrow is another day’ in Jasmine. Sometimes I think it’s not just a story to do about a socialite who gets a reality check but sometimes I think it’s a message from Woody Allen. For all intents and purposes, you’d probably know that Woody Allen is not the type who likes to go to big Hollywood parties. He hardly even makes visits to the Academy Awards. Sometimes I think his is his statement about the social scene and the phonies involved with it. It’s also a story with a lot of good relevance. It may have been more relevant had it been done ten years ago as Paris Hilton was constantly embarrassing moment after embarrassing moment upon herself, and getting more famous off of it in the meantime. Nevertheless it still does show relevance as Kim Kardashian’s exploits still make a lot of copy, if not the same hugeness of copy as say two years ago. Yes, Woody Allen did a very good job of directing and writing this story but it was Cate Blanchett who did the greatest effort in making the character of Jasmine. The interesting thing is that Cate succeeds in making Jasmine to be the charismatic but snooty, phony, superficial, self-indulgent, materialistic socialite who deserves to be looked down upon. But she does something else. Right at the very end, she succeeds in making us actually feel from sympathy for Jasmine. Sure she went from impressing everybody to causing great personal and financial harm to others and ending up with nobody. But for some reason, the end scene actually succeeds in making us feel for Jasmine. What was it? Her willingness to try to do better? Her coming to her senses too much too late? Whatever it was, that was something hard to do and I give Cate great kudos for pulling that off. I think that’s why she has that edge in the Oscar race. The best supporting performance has to go to Sally Hawkins as Ginger: the sister that’s supposedly the inferior one but comes off as the winner in the end. Sally also did a very good job of character acting and made Ginger into a believable and colorful personality. Finally we see which sister has the ‘good genes.’ The female leading roles were the best of the film but the male roles were also great from Alec Baldwin playing the scamming superficial Hal, to Bobby Canavale as the ‘inferior’ Chili, to Michael Stuhlbarg as the sleazy dentist, to Peter Saarsgard as the politician Jasmine has a second-chance with to Andrew Dice Clay as the distraught ex-husband of Ginger (and I hardly noticed any of the ‘Dice Man’ in him). The women ruled the movie but the male supporting roles also added to the story and contained character flares of their own. The movie didn’t really have too many stand-out technical aspects but the scenic cinematography and the music tracks added to the movies charm. Blue Jasmine has all the ingredients of a Woody Allen movie. Only it’s more of a drama than a comedy. Nevertheless it’s something Woody and the actors pull off excellently to make it work. 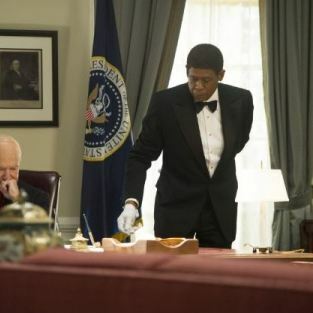 Forest Whitaker plays a butler in The Butler who serves the White House and includes himself in history. Lee Daniels’ The Butler is another surprise hit movie of the summer. It doesn’t feature the typical fare for what one would call a ‘summer movie.’ Actually it features more mature fair that’s meant for a release around October, November or even December. So how did it manage to become a hit this summer? The Butler is a unique story of Cecil Gaines. Born in a cotton field, he was forced into labor by the Westfalls, a Georgia family who owned the plantation. Even though slavery was out of existence, it didn’t stop people from treating their black employees like slaves. The son raped Cecil’s mother and shot his father dead. The state’s caretaker, the mother, takes Cecil out of the farms and assigns him to be a house servant. However it would be a businessman whom encounters Cecil after he breaks into a bakery and steals a cake after running away. The businessman turns him into a successful butler who’s able to provide a good income for his wife and children. Something very rare for an African-American man to be able to do before 1960. A breakthrough occurs when Cecil is offered a job as a butler at the White House. This is a big breakthrough for the Gaines family as they can improve their way of life. However it does not come without its prices as Gloria feels alienated from Cecil and his workaholic manner and turns to adultery. His son Louis becomes very involved with political activism and the Civil Rights Movement from restaurant sit-ins to the Black Panthers movement. That doesn’t sit well to Cecil at all to the point they fight and they don’t speak for years. His 34 year career as a butler in the White House takes some turns as he’s able to converse with the president and even influence many on how they deal with African-Americans. Cecil is also involved in other incidents such as the riots after Martin Luther King’s assassination to losing his son in the Vietnam War. The story intertwines with his career with social changes for Black America during that time period with his own family life from his childhood to his career to Obama’s inauguration. A short while back when I was doing a Wikipedia search on the movie, I learned that this film is loosely based on Eugene Allen: an African-American butler who first served in the White House in 1952, advanced to Maitre d’Hotel in his career and finally retired in 1986. The movie admits that this is inspired by a true story rather than actually being a true story. Though one can doubt the truthfulness of the story, the script by Danny Strong does capture one’s attention and is able to mix the White House life of Cecil with moments of history and even the struggle of one family dealing with the changes and trying to make life better for themselves and for their race. It’s almost like Cecil could be labeled the ‘Black Forrest Gump.’ The relationship between Cecil and Louis also highlights the divisiveness between two generations of African Americans. One learned he had to work hard to get places. Another adopted the new attitudes of Black pride during the 60’s. The clashes between the two represent the clashes of the two generations of Black America. Lee Daniels also does a very good job of directing the movie with its complexities. This is a big move for him to go from something like Precious to something more polished. Nevertheless it’s a very good move and can allow him to replace Spike Lee as the top African American director in the business. The actors were also excellent, especially Forest Whitaker as Cecil. I’m not sure if Forest is trying to imitate Eugene Allen or trying to make Cecil into his own character–I admit that I myself have never seen video footage of Eugene Allen–but he gave an excellent performance both in terms of the character’s personality and his aging. Oprah Winfrey also gave an excellent performance as Gloria encompassing the struggles of maintaining family unity while dealing with a husband that seems too preoccupied with success. David Oyelowo achieves a personal breakthrough here as Louis Gaines. He does a very good job of representing the new black attitude of his times in both life and personal political attitude through Louis Gaines. Supporting acting was also very good from star actors like Terrence Howard, Lenny Kravitz, Vanessa Redgrave, Mariah Carey and Jane Fonda. The supporting acting performances from the lesser-known actors like Mika Kelly, Nelsan Ellis, Elijah Kelley, Clarence Williams III and Yaya da Costa were also very good and added to the ensemble cast. One thing that struck me about Yaya da Costa’s performance of Louis’ girlfriend is the Black Panthers scene where she has a big afro and admits her desire to kill. Didn’t she remind you of Angela Davis in that scene? There’s one glitch in the movie, it’s the casting for those who portray presidents in the past. At first I thought Robin Williams as Eisenhower was a good choice but the others didn’t seem so. John Cusack made Richard Nixon seem awfully young as did Liev Schreiber as Lyndon Johnson and James Marsden as John F. Kennedy. All three of them were at least ten years younger than the presidents they played when they assumed office. I feel the biggest miscast was Alan Rickman as Ronald Reagan. Reagan had a charming personality and Reagan was not seen as charming at all in the film but rather a toughie. Makes me wonder what was with this? Was it miscasting? Or were those the ways the presidents looked to Lee Daniels or through the eyes of Cecil Gaines? One final note of the movie. This was the scene near the end showing Obama’s election to the Presidency in 2008. I know that there has been a ton of flack given to Obama over what he’s done or what he’s failed to do as President of the United States. One thing you can’t deny is that even in the five year’s since his election, he’s still the face of hope for a race and other racial minorities. That’s one thing that can’t be taken away. Lee Daniels’ The Butler is an excellent movie worth watching. I have sometimes co-related to movie to Forrest Gump where a man is part of history. Despite some of its flaws, it was an excellent intelligent alternative to the hyped-up summer stuff and still draws audiences now. Midnight In Paris turned out to be one of the most unlikely sleeper hits of the summer. Little was expected of it: Owen Wilson being the biggest name, a romance featuring characters older than the 20’s, a Paris setting and a trip back to the past. Somehow it was able to capture people’s imaginations and make moviegoers want to see it. The story is about Gil: a Hollywood screenwriter who’s successful but easily distracted. He’s engaged to Inez, a daughter of wealthy conservative parents. While the four are vacationing in Paris, Gil is struggling to finish his first novel about a man working in a nostalgia shop; a novel for which he plans to give up his scriptwriting career and move to Paris for inspiration. This does not sit very well with Inez’s parents as they don’t favor the arts or Paris nor does it sit well with Inez herself as she intends to live in Malibu. Meanwhile Inez’s friend Paul who appears to know a lot of the artistic greats makes things more complicated as Gil finds him insufferable and even phony. After a wine tasking one night, Gil is drunk and alone outside the hotel. At midnight, Gil comes across a coach leading a group to a secret place. Gil joins the group and the people appear to be celebrating 1920’s couture. Later we see that the coach leads to a place where the 1920’s come alive with the Cole Porter, Josephine Baker, Ernest Hemingway, F. Scott Fitzgerald and wife Zelda. He even meets Gertrude Stein and offers her to look over his novel. One catch we learn as he returns to the hotel, he’s back in the present. Gil goes to return the next night novel in hand and offers to bring Inez with him but she’s annoyed with what he says and returns to the hotel. The coach returns at midnight and this time Ernest Hemingway is inside. He gives Gertrude his novel and she introduces him to Picasso. Gil encounters Picasso’s mistress Adrianna whom he has become attracted to. The following day Paul shows Gil and Inez Picasso’s painting of Adrianna at a museum and tells his story about it. Gil contradicts with the truth he just saw the other night, only to annoy both Paul and Inez. Gil visits the past more often for inspiration for his novel which annoys Inez. Her father even hires a private investigator on him, only to be lead to the Versailles during the era of Louis XIV and never to be found again. Gil spends more time with Adrianna, who leaves Picasso for Hemingway. This confuses Gil as he feels he’s falling in love with her. Meanwhile he meets with surrealists like Salvador Dali, Man Ray and Luis Bunuel who see nothing strange about him coming from the future. Gil goes furniture shopping with Inez but comes across and an antiques dealer who’s selling Adrianna’s diary. He also learns from a conversation with the antiques dealer herself that she also has the same fondness for the 20’s Gil has. Later a guide from the Rodin Museum translates Adrianna’s diary and he learns she’s in love with him. Gil returns to the past and confesses his love to Adrianna. A coach leading them to the days of the Belle Epoque drives up and Adrianna opts to go in, talking of how she longs of the days of the Belle Epoque and how the 1920’s are so imaginative. It there that Gil learns about the illusionate lure of nostalgia and learns to accept the present for what it is. In the end, the romantic triangles between all involved take a surprising turn and Gil makes some surprising decisions. I don’t think the movie is stressing too many points but rather telling an amusing love story where artistic inspiration and one’s passion are the top themes. It does pay an admiration for the writers and thinkers in the past but it reminds us to admire their influences rather than dwell back to their time. Another theme that’s common in Woody Allen’s movies is about artists and their inspirations. It shows how a top Hollywood writer feels that burning desire to create a novel that no Hollywood millions can take the place of. Allen puts in many legendary artists, writers and filmmakers—including some from an American expatriate group in Paris at that time–who received their inspiration in Paris to make his point. It also reflects on Allen’s feelings of conservatism being stuffy, especially with the Tea Partiers. Interesting how Gil is an artist mesmerized by legends of the past while Inez’ father admires a political party known for its past thinking. In terms of the movie’s acting, this is the best acting I’ve seen from Owen Wilson. He seems in these past few years to be leaving his past Slacker Pack schtick behind and is now doing more sensible roles. This is an excellent move for Wilson. Here he plays a man who’s smart but easily distracted. Very good job. The supporting roles were also excellent, especially the character acting. Most of the characters of people from the past are so well-acted, you easily forget who the actor is. It took me a while to recognize Adrien Brody as Salvador Dali, Marion Cotillard as Adrianna and Tom Hiddleston as F. Scott Fitzgerald. The most recognizable was Kathy Bates as Gertrude Stein. Nevertheless her acting was still top quality. The best effort has to come from the directing and writing from Woody Allen. I will admit that Woody Allen’s humor and comedies are not as fresh as it was during the 70’s and Midnight isn’t that different. If there’s one thing I like, it’s that Woody Allen is able to keep quality and good effort in comedy. While most comedic writers rely on cheap shots, one-liners and slapstick to make hit comedies, Allen keeps the intelligence in his storylines and presents comedies with amusing situations, full characters and an ending that differs from your typical Hollywood endings. Here we have characters that make you laugh and think at the same time. Here we have a return back to the past that fits the story well. Here we have a romantic comedy that doesn’t end the way your typical Hollywood romantic comedy ends. in terms of box office, Midnight is Woody’s highest-grossing film in North America ever. Impressive. Midnight In Paris is not a comedy for everyone. I don’t think a trip into the past in Paris at the stroke of midnight will draw everyone. Nevertheless it is a refreshing break from your typical predictable, formulaic Hollywood fare and will impress whoever is willing to view it.